I thought it might be fitting to once again examine pushing fractal art into its second phase. Tim laid the initial groundwork for a Phase Two approach to our discipline, and I’ve presented several examples of what a Phase Two fractal art exhibition might look like. One facet of Phase Two reflectivity is to think outside the boundaries of software. Instead, Phase Two manifests fractal art as a general movement expressed broadly in any fine art genre, rather than being shrunk down to the limited box of whatever UF or Apo images happen to be selected (by, say, the two respective program authors) for the Benoit Mandelbrot Fractal Art Contest. One artist who is clearly using fractal attributes in a wider fine art context is Chris Jordan — especially in his series entitled Running the Numbers II. 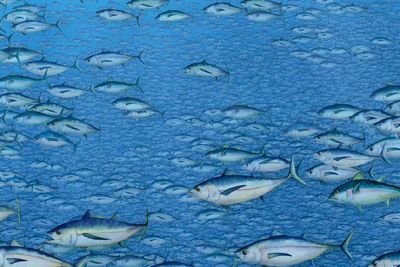 Jordan notes that the series “looks at mass phenomena on a global scale” and observes that each image “portrays a specific quantity of something” — like the estimated number of tigers still in existence or (as in the image detail above) the average number of tuna fished from oceans every fifteen minutes. Jordan’s series uses self-similarity to striking effect. In Tuna, the staggering number of fish netted is demonstrated by many replicated shadow forms. In Tiger, the 3200 remaining tigers form a border at the edges, but the bulk of the piece is blank and black. 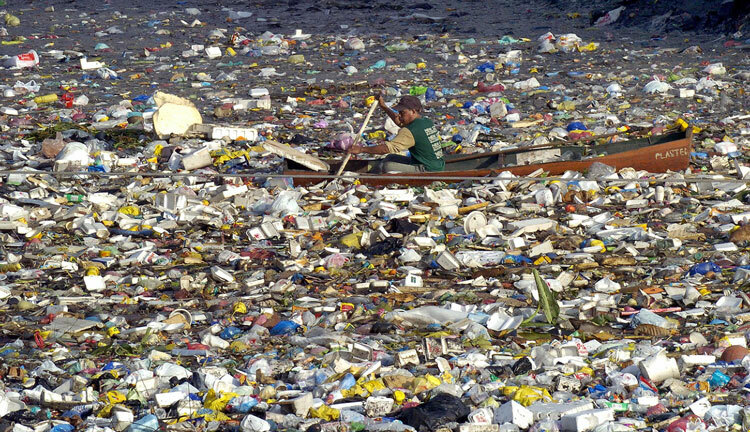 The superb use of absence represents what has been lost, since the middle space would hold 40,000 more tigers — the global population of the animal in 1970.
an area in the mid-Pacific where the clockwise circulation of currents slowly works discarded plastics into a central area (about twice the size of Texas!). 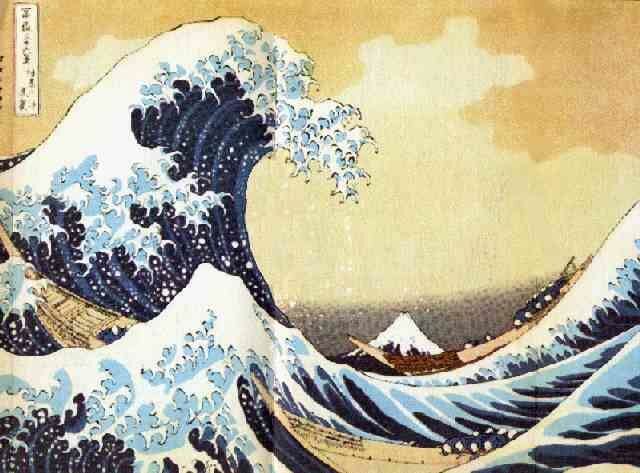 Riffing on Katsushika Hokusai‘s The Great Wave (aka The Breaking Wave Off Kanagawa), probably Japan’s most famous woodblock print, Jordan’s re-contextualization shifts the menace away from the original suggestion of a tsunami. 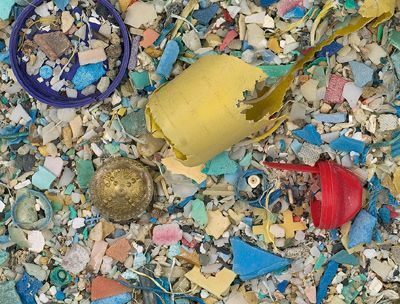 The danger comes not from the power of the wave itself — but rather from the millions of plastic particles contained within it. 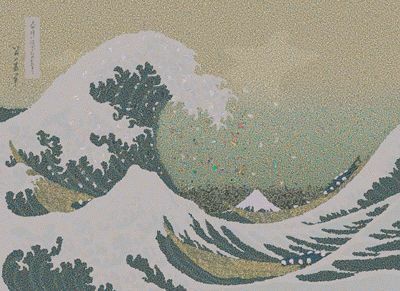 depicts 2.4 million pieces of plastic, equal to the estimated number of pounds of plastic pollution that enter the world’s oceans every hour. 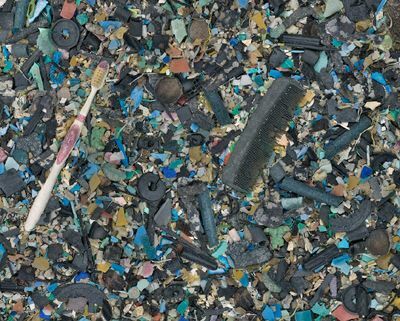 All of the plastic in this image was collected from the Pacific Ocean. 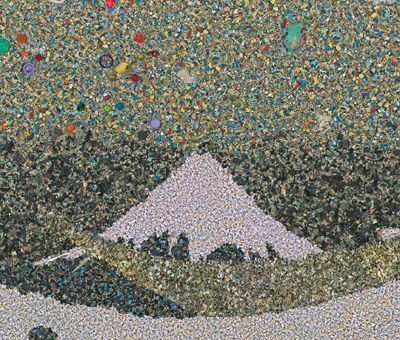 From a distance, the millions of self-similar plastic bits and debris are impressionistically arranged to mirror Hokusai’s iconic wave. 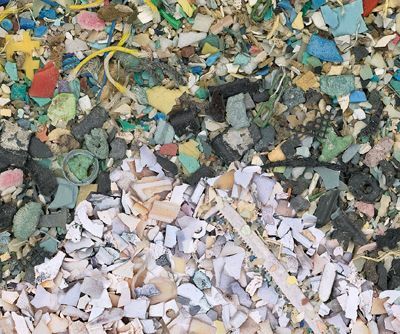 But the most striking fractal dimension of Jordan’s Gyre is the ability to zoom into it. First, look at Jordan’s image above and focus on the snow-capped mountain in the background. Now — Zoom! Mandelbrot is referring to the use of carefully choreographed fractal art slideshows for raves and similar venues. I am of two minds about this development. A well-orchestrated rave can be a highly moving, even artistic experience. I see tangible benefits if fractal art can contribute to the overall enjoyment of such events, as well as becoming a more recognizable art form to a general public. Then again, I’d like to see fractal art progress beyond the Grateful Dead backdrops of more than forty years past. If fractals are nothing more than trippy effluvia, the jump from Ecstasy-enhanced flitting eyecandy to bona fide fine art form is not likely to be forthcoming. That’s why Jordan’s Phase Two, fractal (based) art is so encouraging. It’s socially relevant and politically tinged — not designed to be just another decorative projection on a scrim. Jordan understands, as I’ve argued before, that fractal art must be more than beautiful to be viable. Sometimes there is a barrier of diffidence when approaching a piece of art. We are not always sure what we are looking at. Fractal art quilts go a long way to breaking down that first moment of uncertainty. 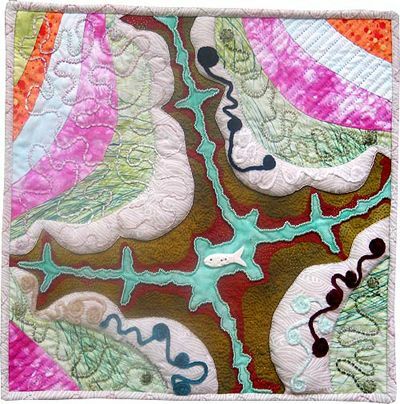 The strange, complex images combined with the sensuous substance of a quilt are very compelling. 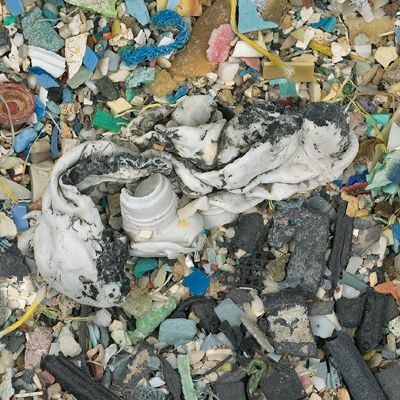 The urge to touch draws us into the work, creating an immediate connection between the artist and ourselves. Rushbrooke’s work is unique and exquisite. 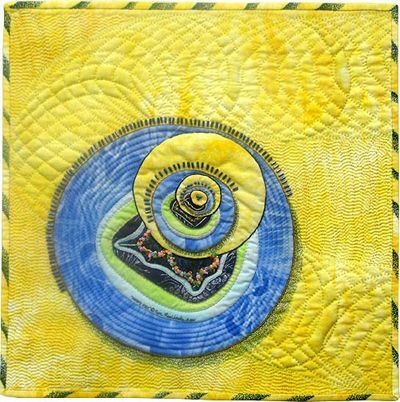 Please visit her web site to see additional art quilts, artist’s statements, photographs of exhibitions, tutorials, and other informational articles.